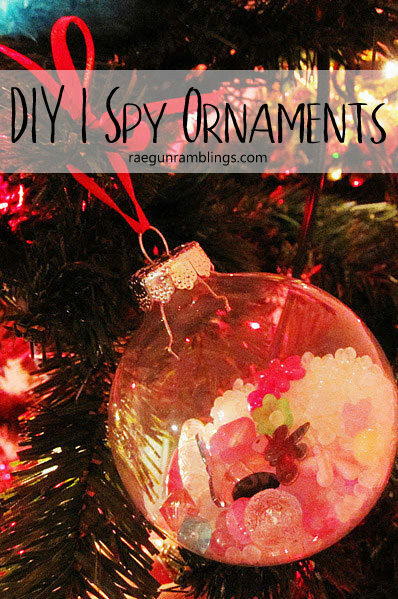 The kids will love making these darling I spy ornaments and what they pick to fill theirs will be a fun journey down memory lane in years to follow! 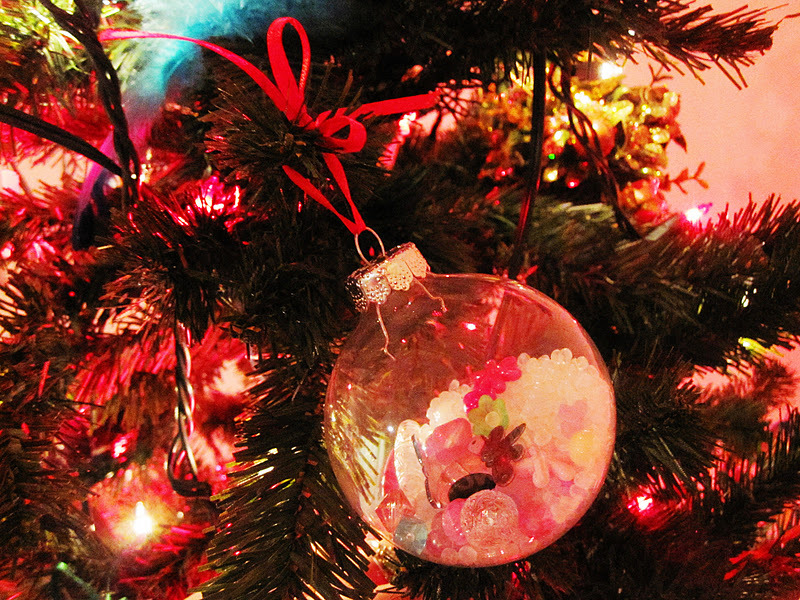 Last week I pinned a bunch of cute ornaments. I really wanted to make these mod podged fabric ornaments but even though every other day the girls are at my house they love cutting fabric into pieces they were having none of that during last week’s Christmas Craft Day. So since I happened to have a bunch of stuff on hand that I could use for the I Spy Ornament that I had also pinned I set the naughty nieces up to make those instead and they turned out pretty cute and were really fun to make. 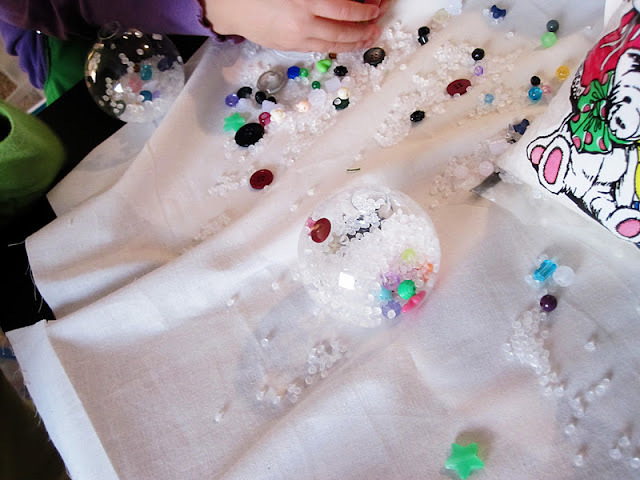 First I laid some fabric on the table so if the naughties spilled the beads, as was inevitable, there was a chance that they’d stay on the table instead of roll on the flour to be lodged in someone’s foot. Then after I removed the metal hanging part from the ornaments. I poured some poly pellets (left over from I Spy Bags from ages ago). 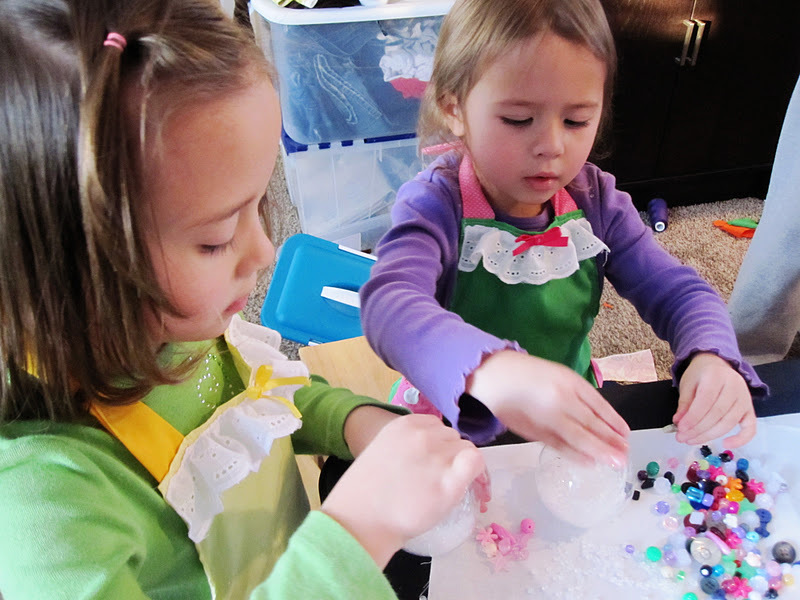 They’ve got a big bag of beads, buttons and jewels that they use to make necklaces so I just told them to put some in. I tied ribbon to use to hand them with and they were done and the girls had a lot of fun. The next day I went to a craft store to buy some cute miniatures to add but I didn’t see anything that would be small enough to fit in the ornament neck but I think they’re cute as is anyways and 100% reflection of the kiddos’ creativity. Plus it was awesome that I had everything on hand. This was so fun and easy it would even be a cool gift to do on Christmas. If you need something easy that will entertain the kids this might be fun to try. Well next year you can print a small photo of the kid who made that ornament and slip it in afterwards. Then it becomes a keepsake for that kid. Great idea and they look amazing!